This entry was posted in News on May 31, 2013 by LED Strip Lights Team. Can't decide between warm and cool LED Strip Lights? Now you can have both with our brand new range of Dual Colour LED Strip Lights. Dual Colour LED Strip Lights feature 30 cool and 30 warm LEDs per metre, allowing you to effortlessly switch from warm to cool and back again. All you need is our Dual Colour Touch Controller, featuring a touch-sensitive temperature wheel and brightness settings. 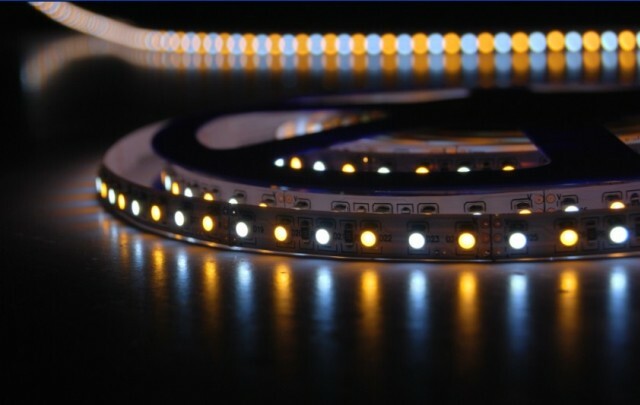 As with all our flexible LED Strip Lights, we can cut your Dual Colour LED Strip Lights to specific lengths if required. Simply call us on 0116 321 4120 to discuss your requirements or them in an email to support@ledstriplights.co.uk. No need for fittings and brackets. Simply peel off the 3M backing and stick down! For a more permanent fitting option, don't forget to check out our aluminium LED Profiles and Extrusions. For kitchens and bathrooms choose our Dual Colour LED Strip Lights with an IP65 rated coating. This offers protection against moisture and condensation. Our Dual Colour LED Strip Lights are covered by a 2-year guarantee for your peace of mind. For more information about our Dual Colour LED Strip Lights, contact our customer service team on 0116 321 4120 or email support@ledstriplights.co.uk. This entry was posted in News on May 1, 2013 by LED Strip Lights Team.